To Cite: Mozafari J, Fatemi N, Afshari G, Mirzai N, Attarzadeh S, et al. The Clinical Audit of Bed Falls in General and Emergency Units Patients, in Golestan Hospital, September 2014 - March 2015, Jentashapir J Health Res. 2017 ; 8(5):e60818. doi: 10.5812/jjhr.60818. Background: Bed falling is the most common unintentional cause of injury in all age patients and is a major safety problem in health facilities. The main objective of this study was to evaluate the effectiveness of clinical audit to prevent patient falls in general and emergency units at Ahvaz’s Golestan hospital. Methods: The study population consisted of at-risk hospitalized patients in the general and emergency units over a six-month period. In accordance with the clinical audit cycle, the weak points were found, proper interventions were implemented based on the standard guidelines for bed falling, and then another audit was performed again to assess the effectiveness of our intervention. Results: Measuring the level of interventions before and after the clinical audit showed an increase in all study variables. The falling results revealed that these interventions reduced bed falling by more than 50%. Conclusions: The clinical audit for reducing bed falling incidents in the study units led to the improved patient safety and care according to the standards of care. Bed falling as a common health issue mostly occurs in elderly patients that need intensive care in the healthcare facilities (1). Falling has many definitions in texts and literature, such as unintentional and sudden change of position, landing on a lower level, object, floor, or other surfaces, sliding, colliding with other people, loss of balance, and trapping legs (2). Even, falling with no injury makes fear and distress in the older patient (3). Based on the evidence, about 5% of falls lead to fracture, 5% - 11% causes other serious injuries and in older adults, falling is the leading cause of death (4, 5). At the hospital, the common risk factors of falling are age, chronic diseases, muscle weakness, gait disorders, mental status alternations, and medications (6). Despite longer clinical treatments, falling imposes an extreme cost to the patient and society because of the need for repeated physician visits, more para-clinical measurements, and longer staying at the hospital (4). The aim of this study was to design the best and appropriate plan to prevent patients from falling in order to decrease severe injuries. The current study is a prospective interventional study conducted on high-risk patients disposed to falling in emergency and general units, over a six-month period from 2014 September to 2015 March. The study was approved by the ethics committee of Ahvaz Jundishapur University of Medical Sciences. Because of the caring aspect of this study and subsequent positive results, written informed consent was not needed. In this experiment, high-risk patients in terms of falling were admitted and included in the study. ICU and CCU patients were excluded from this intervention. An initial evaluation was performed with questionnaires, observation, and interviews with patients and nurses. The questionnaire used for this clinical audit was derived from the national institute for health and care excellence standard (NICE) for patient falls as shown in Table 1 (7). The primary results were evaluated and compared with the NICE guideline standards in order to find differences between the standard care and our situation. Subsequently, interventions based on standard guidelines were applied. After 30 days, the second evaluation was performed with standard questionnaires, observation, and interviews. The statistical analysis was performed using SPSS 16. The Chi-Square test was used. P values less than 0.05 were considered significant. The first set of analyses examined the impact of clinical audit on falling that showed there was a significant difference between the falling incidence before and after the audit. In two similar periods, falling incidents decreased about 55%. Before the intervention, 5.2% of high-risk patients were identified, which after the audit, significantly rose to 33%. In addition, with the extent of observation, the implementation of care plan increased from 67% to 92.9%. In this project, the implementation of the falling prevention plan developed from 9.2% to 92.3%. The evaluation of high-risk patients during the first 24 hours of hospitalization increased from 61.6% to 98.2%. The assessment and documentation of high-risk patients improved from 1.9% to 9.7% after the intervention. The placement of high-risk patients in nurses’ view increased from 83.3% to 97.7%. The consideration of factors contributing to falls was 84% that reached 96.3% after the intervention. Before the intervention, 57.2% of nurses used proper bed rail techniques that rose to 99% after the intervention. After the intervention, the rate of beds equipped with bed rails reached 99% while it was 37.2% before the intervention. 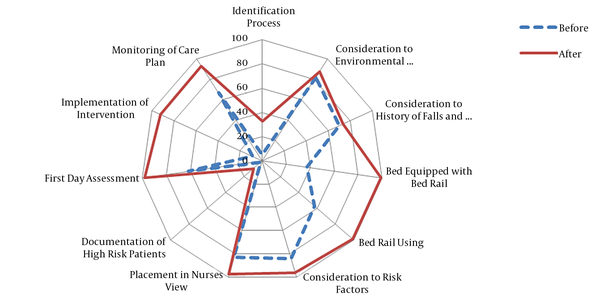 The documentation of bed rail use increased from 64.7% to 79.5%. The rate of consideration in the history of falls and ataxia increased from 69.9% to 73.4%. Before the audit, 81.9% of environmental high-risk factors for patients were considered that rose to 87.6% after the audit. Providing a safe environment for elderly patients increased from 96.4% to 97.1%. The assessment of injuries related to falling increased from 98.2% to 99.2% after the audit. Figure 1. The level of interventions before and after the clinical audit. **P < 0.01 vs. before the audit, ***P < 0.001 vs. before the audit. Falling out of bed is a common health issue that mostly occurs in patients in intensive care units, health care facility residents, old people, and high-risk patients (4). In the current clinical audit, 10 caring measures significantly increased, which included high-risk patients identification with a positive history of falls, supervisors’ observation over the implementation of care plans, the implementation of the falling prevention care plan, the evaluation of high-risk patients during the first 24 hours of hospitalization, the assessment and documentation of high-risk patients, the placement of high-risk patients in nurses’ view, the consideration of factors contributing to falls, the proper use of bed rail techniques, the number of beds equipped with bed rails, and the implementation of falling prevention care based on individual needs. In 2011, Patricia and colleagues conducted a study on the causes of patient falls and possible preventive measures in acute care units. Their findings indicated that appropriate, accessible, practical care programs and the development of knowledge and skills of caregivers are the factors that possibly reduce the fallings (8). In the current clinical audit, the mentioned factors were implemented in the patient care process that led to the prevention of falling. According to Graham evidence-based reviews about falling prevention in hospitalized patients in 2012, pharmaceutical inspection, documentation of falls, and environmental factors were taken into consideration. In addition, in order to maximize the beneficial effects of prevention, nurses must assess the level of falling risk and select the best method of care in each patient to reduce patient falls and subsequent injuries. Other recommendations related to falling prevention are the use of new technologies such as designing and improving the safety beds, the use of non-slip shoes, and patient tracking (9). In this audit, the use of bed rail matched the standard and correct use of bed rails. In another project to reduce patient falls, an investigation was carried out on hospitalized patients older than 16 years and found strategies to develop the care measures and reduce the risk of falling. Furthermore, they introduced a standard and reliable intervention to be used in order to reduce the risk of falling (10). In this clinical audit study, the mentioned standards and NICE guidelines were used, which significantly led to the improvement of care and prevention of falling in our hospital. In 2007, British Geriatric Society conducted a systematic review of risk factors and management tools for prevention of patients’ falls; the number of constant and repetitive risk factors was identified and some simple hints for prediction of falls were recommended. Some considerations to note are psychotherapeutic drugs, confusion or impaired judgment, abnormal hemolytic lab findings, and age above 80 years old. The highest incidences of falling were seen in neurology, cardiology, and malignancy wards with disabled and lethargic patients. In addition, the highest rate of falls was seen in the peak working hours, i.e. 5 A.M. to 5 P.M. (11). In the current study, the most important factors contributing to falling were the lack of identification of patients with histories of falls, the lack of care and prevention plans, the lack of proper beds and bed rails, the inappropriate wards floor and finally, the imperfection in the documentation of high-risk patients. Another review study demonstrated that by improving the safety tips related to potential and actual risk factors for elderly patients, the falling incidence obviously decreased (12). Similarly, our clinical audit revealed that the accurate identification of risk factors had a positive impact on the intervention effectiveness. A retrospective study carried out in 2005 for orthopedic injury concluded that falling in older patients mostly occurs in a variety of skeletal injuries and low mobility before falling (13). In our experiment, 5% of patients endured an orthopedic injury in which, the most important causative factors were the lack of patients’ aids, the lack of consideration of risk factors by the medical team, and the lack of care and prevention plans. There is a growing body of literature recommending that preventive measures, appropriate care, early identification of at-risk patients, appropriate and accessible practical care programs, consideration of environmental factors, the awareness of elderly patients’ needs, and the use of bed rails for patients at home or in the hospital result in sustained reductions in falling rates (14-16). Finally, the current study revealed that the identification of risk factors and preventive measures significantly reduced the number of falling in patients. Some limitations of the current study were incorrect and incomplete data in primary patient evaluation forms due to admission errors, clinical staff shortage, and misuse of nursing care protocols. Other contributing factors may be the high rate or patient’s turnover in emergency and general wards and a deficiency in the documentation. This paper was derived from a research project approved by Ahvaz Jundishapur University of Medical Sciences. Our thanks and appreciations go to the Golestan hospital clinical research development unit, Ahvaz Jundishapur University of Medical Sciences. 1. Scuffham P, Chaplin S, Legood R. Incidence and costs of unintentional falls in older people in the United Kingdom. J Epidemiol Community Health. 2003;57(9):740-4. doi: 10.1136/jech.57.9.740. [PubMed: 12933783]. [PubMed Central: PMC1732578]. 2. Feder G, Cryer C, Donovan S, Carter Y. Guidelines for the prevention of falls in people over 65. The Guidelines' Development Group. BMJ. 2000;321(7267):1007-11. doi: 10.1136/bmj.321.7267.1007. [PubMed: 11039974]. [PubMed Central: PMC1118778]. 3. Layne LA, Pollack KM. Nonfatal occupational injuries from slips, trips, and falls among older workers treated in hospital emergency departments, United States 1998. Am J Ind Med. 2004;46(1):32-41. doi: 10.1002/ajim.20038. [PubMed: 15202123]. 4. Perell KL, Nelson A, Goldman RL, Luther SL, Prieto-Lewis N, Rubenstein LZ. Fall risk assessment measures: an analytic review. J Gerontol A Biol Sci Med Sci. 2001;56(12):M761-6. doi: 10.1093/gerona/56.12.M761. [PubMed: 11723150]. 5. Weatherall M. Prevention of falls and fall-related fractures in community-dwelling older adults: a meta-analysis of estimates of effectiveness based on recent guidelines. Intern Med J. 2004;34(3):102-8. doi: 10.1111/j.1444-0903.2004.t01-15-.x. [PubMed: 15030457]. 6. Tinetti ME, Speechley M, Ginter SF. Risk factors for falls among elderly persons living in the community. N Engl J Med. 1988;319(26):1701-7. doi: 10.1056/NEJM198812293192604. [PubMed: 3205267]. 7. Centre for Clinical Practice at NICE (UK). Falls: Assessment and Prevention of Falls in Older People. London: National Institute for Health and Care Excellence (UK); 2013. 8. Dykes PC, Carroll DL, Hurley A, Lipsitz S, Benoit A, Chang F, et al. Fall prevention in acute care hospitals: a randomized trial. JAMA. 2010;304(17):1912-8. doi: 10.1001/jama.2010.1567. [PubMed: 21045097]. [PubMed Central: PMC3107709]. 9. Graham BC. Examining evidence-based interventions to prevent inpatient falls. Medsurg Nurs. 2012;21(5):267-70. [PubMed: 23243782]. 10. Barnett K AK, Bairstow C, Briody K. Reducing patient falls project. Mid Yorkshire hospitals NHS Trust; 2002. 11. Alsenany S. Prevention of patient falls in university hospital. Br Geriatr Soc. 2010. 12. Soriano TA, DeCherrie LV, Thomas DC. Falls in the community-dwelling older adult: a review for primary-care providers. Clin Interv Aging. 2007;2(4):545-54. [PubMed: 18225454]. [PubMed Central: PMC2686332]. 13. Nadkarni JB, Iyengar KP, Dussa C, Watwe S, Vishwanath K. Orthopaedic injuries following falls by hospital in-patients. Gerontology. 2005;51(5):329-33. doi: 10.1159/000086370. [PubMed: 16110235]. 14. Oliver D. Falls risk-prediction tools for hospital inpatients. Time to put them to bed? Age Ageing. 2008;37(3):248-50. doi: 10.1093/ageing/afn088. [PubMed: 18456789]. 15. Tzeng HM, Yin CY. Frequently observed risk factors for fall-related injuries and effective preventive interventions: a multihospital survey of nurses' perceptions. J Nurs Care Qual. 2013;28(2):130-8. doi: 10.1097/NCQ.0b013e3182780037. [PubMed: 23117794]. 16. Ravindran RM, Kutty VR. 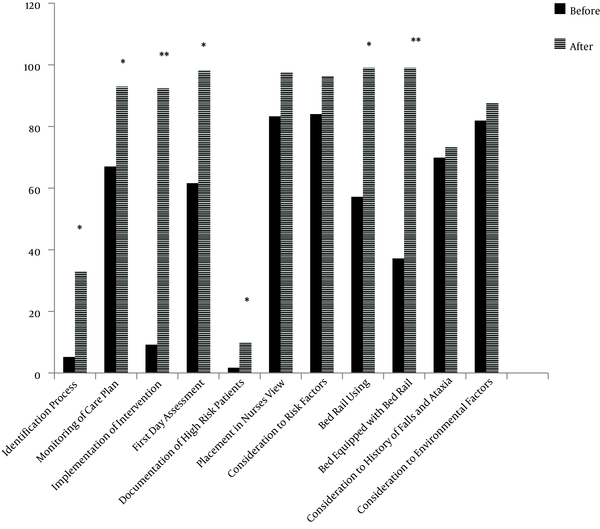 Risk Factors for Fall-Related Injuries Leading to Hospitalization Among Community-Dwelling Older Persons: A Hospital-Based Case-Control Study in Thiruvananthapuram, Kerala, India. Asia Pac J Public Health. 2016;28(1 Suppl):70S-6S. doi: 10.1177/1010539515611229. [PubMed: 26463576]. [PubMed Central: PMC4796756].